Your corporate typeface is your brand’s voice. Any message presented in your typeface, from a brand name on packaging, to the terms and conditions on your website, will be read in the voice of your brand. Commissioning a font is often part of a wider branding project, so we’ll partner with you to develop your typeface alongside the rest of your visual brand assets. A unique typeface would become the key ingredient of your identity system. It would be your new voice. Different to your competitors. More considered. Better. Our retail typefaces are already unique. Sometimes our clients recognise something immediately that chimes with what they want their brand to express. 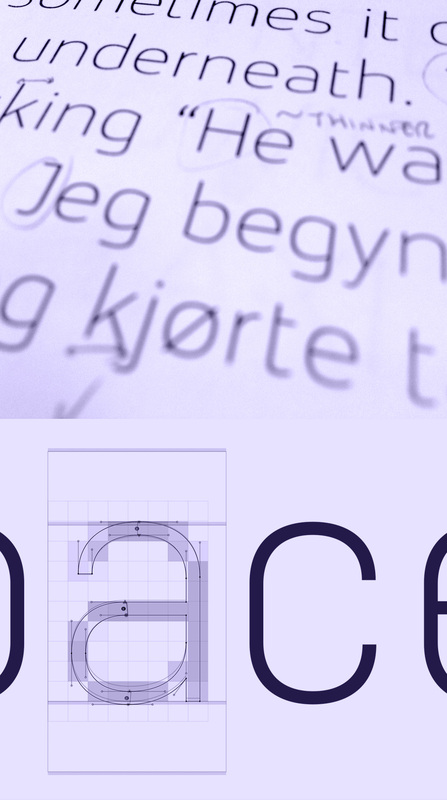 With tweaks to a couple of glyphs, a new identity can be created very simply and effectively. Sometimes it will require a more in-depth change, such as the addition of serifs or introducing features based on other brand assets. Either way, font modification could be a faster and more cost effective solution for owning your unique brand typeface. For ambitious brands, a visual identity needs to be unique and exclusive. This is best achieved with a bespoke typeface, created from scratch, based on the brand’s principles and values. We collaborate closely with design agencies and marketing teams to make sure the bespoke typeface completely embodies the brand’s personality, even when it’s seen in isolation, without other brand components. Our processes are very flexible and integrate seamlessly with an agency’s brand design process, striking the ideal balance between quality and speed. A bespoke font doesn’t have to be a lengthy and expensive project. We work with a fast turnaround incorporating feedback and building towards the desired result, with the initial prototype available for the creative team within the first week. Our price tag for a bespoke display font starts at €9k, including Intellectual Property Rights transfer. That gives you the confidence that comes with owning your own exclusive typeface. What could a new font do for your brand?